With the Wai Koa Loop Trail as a center point, there are multiple routes radiating out from central Kilauea. The first is the Kahiliholo Road, known alternatively as Kalihiwai Ridge. This ridgeline is a challenging climb to a highpoint looking out over the north shore, and the houses here are spectacular. The route starts out as a trail and runs along Kahiliholo Rd., which doesn’t have a sidewalk or shoulder but isn’t too trafficked. It’s hilly but grades don’t exceed 3%. 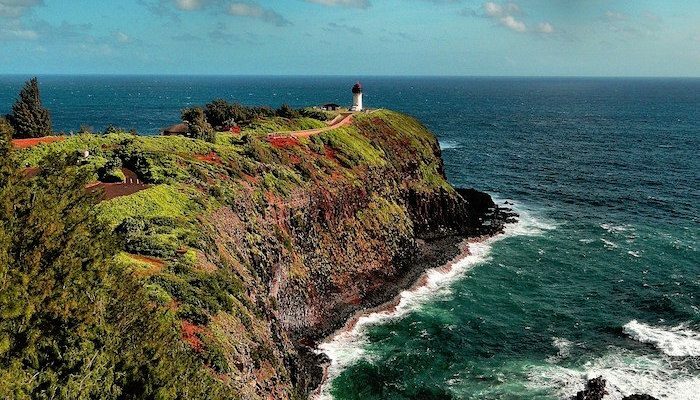 The other option is to head northeast from the park and join up with Kilauea Road, which runs towards the coast all the way out to the Kilauea Lighthouse — a great spot to stop and enjoy the scenery before turning around for a 4.5 mile out and back. There is a sidewalk/shoulder a good part of the way. Bonus: End your run with a treat at Garden Island Chocolate!